At 7:18 a.m. on September 19, 1985, a massive 8.1 earthquake devastated Mexico City, claiming at least 10,000 lives, leveling some 400 buildings and severely damaging thousands more. The ground had hardly stopped shaking when a man named Héctor Méndez raced to the center of the carnage in a desperate search for his brother. He would find brother Carlos alive, but saw that he was surrounded by many others who weren’t so lucky—their cries to missing loved ones answered only by heart-wrenching silence. Immediately, Méndez joined a nearby group of survivors digging through the rubble in search of anyone alive, putting his own life in peril. The rescue effort would continue for hours, and Méndez would emerge from it too exhausted even to dial a telephone. When it was over, Méndez had helped to rescue four people from certain death. Among those he saved was a man who had lost an arm, a leg and an eye to a crumbling building. 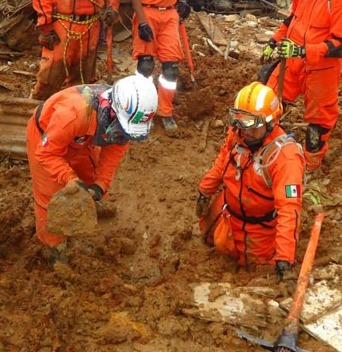 Soon after the earthquake, Méndez formed a volunteer search and rescue group called Los Topos Aztecas, now known simply as Los Topos (The Moles). 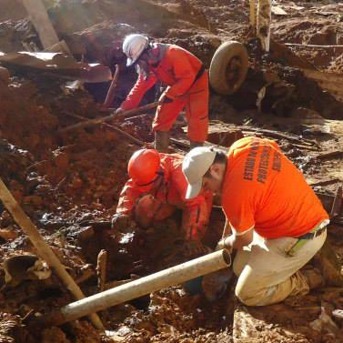 Today Los Topos are considered one of the world’s most elite earthquake rescue teams. In the three decades since the Mexico City quake, Los Topos have traveled the world, helping with rescue efforts in disaster-hit areas and saving countless lives. They brought their courage and highly specialized skills to Ground Zero in 2001, to Indonesia after the deadly 2004 tsunami, to Haiti after the 7.0 quake in 2010; and to dozens of other crisis sites in more than 20 countries. While in Haiti, Méndez observed men and women in yellow shirts—Volunteer Ministers of the Church of Scientology—bringing food, water and other vital aid into devastated communities. Late one night, two Volunteer Ministers came to Méndez’s tent. But they did come again, and Méndez, a man of indomitable courage himself, was impressed. So it was that members of Los Topos came to be trained in the methods of the Volunteer Ministers, adding these tools to their own considerable skill set. As they have done at hundreds of disaster sites worldwide, in Haiti the Volunteer Ministers assisted survivors and first responders, providing medical supplies, food and water, and establishing and running shelters. They also delivered “assists”—techniques developed by L. Ron Hubbard that address the emotional and spiritual factors in shock, trauma and stress. The partnership between Los Topos and the Volunteer Ministers has seen action many times. In 2013, when Hurricane Manuel brought devastating wind, rain and mudslides to Acapulco and southern Mexico, a combined team of 89 Los Topos members and Volunteer Ministers responded.